Jim is dead. Bree hasn’t said a word since it was done. Kira dosed her an hour ago to make her sleep. It was Alex’s suggestion, he said some rest would bring her around. Kate is trying to get something out of that damned logistical computer so we can figure out what year it is. Once we figure that out, we might find out what went wrong with Jim. It seems that he came out of hibernation early, before the Can was ready to eject the fluid. He drowned. The question is, how long ago did he drown? There was not much left of him in there. The decay was excessive. I’m not going to describe it, but there was blood on the Can’s door. He tried to claw his way out. It gets worse, much worse. After we found Jim, Kate went to the bridge. The rest of us sat around Medical while Kira and Anne prodded Jim’s remains. When she came back, she ordered us all up to the observation deck. We didn’t know why, but I think we were too shocked to ask questions. She opened the windows and there we were. Alpha Centauri. Two bright stars staring at us like beacons in the dark. There are planets too, but we can’t tell how many, we are still too far away. And then, as our rotation brought us around, we saw the Chinese ship. It was right in front of us, slowly spinning end over end like a giant white bullet. We were so close that we could tell there were no lights on it. Kate said there were no energy readings from it at all. It was dead. 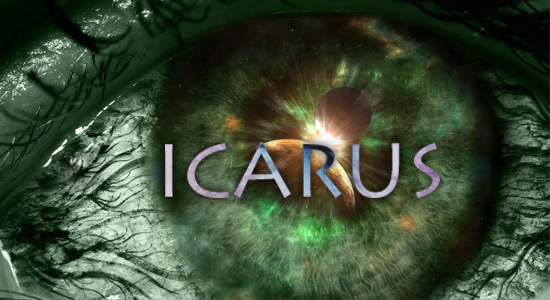 At first, I assumed that the Icarus’s lasers had hulled it but Kate said it had no damage whatsoever. So we’re waiting now, waiting to hear what year it is and waiting to hear what we’re going to do about the Chinese ship. I don’t feel any older, don’t look any older either. There’s a pain in my chest when I breathe too deep but other than that, no change. What had happened while we were asleep and, more importantly, how long were we asleep? The Cans should have brought us out at the correct, subjective time, but what if it didn’t? What if the Time-Vortex did something? What if the extra-long burn shorted something out in our timetables? We are time travelers without a sense of time and men and women stranded and fearful. One of us is dead and nine more that all want to know why and how. I thought of Sarah and all those words she wanted me to hear. Had I really not lived then? And will I ever live to find out? This entry was posted in Icarus, Original Fiction, Science Fiction and tagged Alex, Alpha Centauri, Anne, blog fiction, Bree, Can, computer, Evan, Icarus, Jennie, Jim, Kate, Kira, logistics, Mike Kern, Rich, Science Fiction, SciFi, space, Time-Vortex, Tunnel, Vortex-Entry couches, William Shriver. Bookmark the permalink. Whoa! This is cool!! I feel like I’m in a movie reading this. I love the idea of time travelers being stranded and fearful. Whether in real life or fantasy, this is a theme that rings truth in all us during our human experience.